Student ministry is hard work and to do it effectively takes many hours of prayer, Bible study, strategy, organization and relationship building. This is one reason why student pastors may decide to be minimally involved in parent ministry. 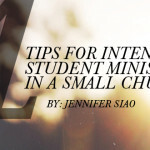 The argument is that student ministry is about the students and there isn’t enough time in the day to lead an effective ministry to students and an effective ministry to parents. I would agree. There isn’t enough time in the day for you as the student pastor to effectively lead both of these effort — if you are trying to do it all yourself. Your ability to recruit and train adult volunteers will directly impact your ability to lead an effective ministry to students AND an effective ministry to parents. Student ministry is too large of a task for any one person to take on alone. Because of this, leadership development is essential for three primary reasons. 1. Students need relationships with adults who love Jesus. Yes, this begins with their parents but it should extend to you as the student pastor and to the adult leaders that you are responsible to equip. As your student ministry grows, the likelihood of you having a direct and meaningful relationship with every student will dwindle. It is critical that you develop the adult leaders in your ministry for the purpose of these relationships. 2. As the adult leaders you have trained and discipled begin to minister to groups of students you will be able to spend more time organizing and implementing a ministry to parents. 3. The sad reality (and the thought that many of you may have had while reading this blog series) is that there are many students who are missing the parent element altogether. There are students in your ministry whose parents aren’t believers and there are students who come from awful home environments. It is for these students that you and your team of staff or adult leaders take on the role of primary discipler for the purpose of reaching the rest of the family with the gospel. In essence, you are training these students to be on the mission field in their own home. When talking about parent ministry and the importance of their role as primary discipler, we cannot forget about this very large segment of students who don’t have that as an option. They need to see Jesus in you and your adult leaders. The truth about student ministry is that it takes a team of people. It takes you as the student pastor, it takes parents, and it takes some Jesus-loving adult leaders. Truly effective student ministries, the ones who make long-term disciples of students, will be ministries that develop this team of people in order to lead an effective ministry to both students and parents. Read more about Parent Ministry.